Techdirt - Friday, March 22, 2019. A little more than a month ago, we covered the ultra-weird offshoot of FBI forensics spearheaded by Richard Vorder Bruegge. 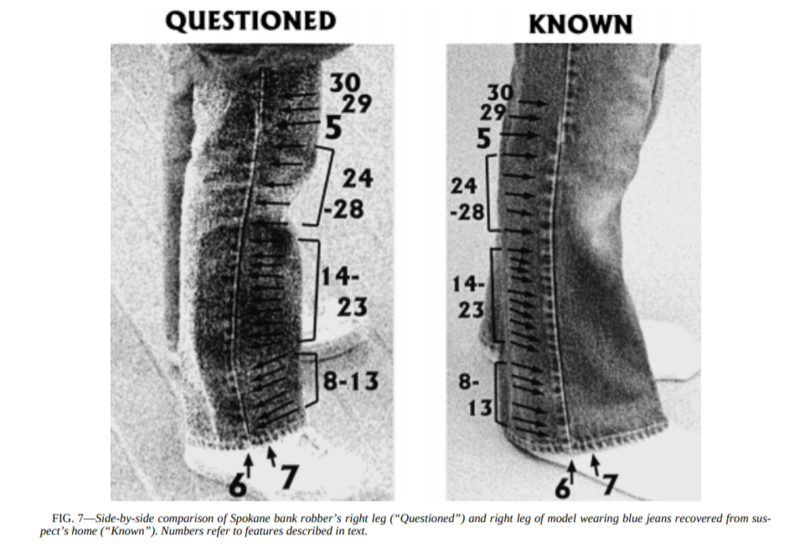 Vorder Bruegge claimed mass-produced clothing like jeans were as unique as fingerprints and DNA. According to his forensic "expertise," a match could be made using only low-res CCTV screengrabs and whole lot of arrows. This peculiar strand of FBI forensics is still in use. Vorder Bruegge, rather than being laughed out of the FBI forensic lab, has risen to a position where he can pass on his dubious expertise to others. ProPublica continues to dig into the FBI's questionable forensic programs and has found that Vorder Bruegge is now sitting near the top of the nation's forensic organizational chart. Today, Vorder Bruegge is one of the nation’s most influential crime lab scientists. He serves on the Forensic Science Standards Board, which sets rules for every field, from DNA to fingerprints. He’s a co-chair organizing the American Academy of Forensic Sciences meeting this week in Baltimore, a gathering of thousands of crime lab professionals, researchers, lawyers and judges. This has happened due to Vorder Bruegge's testimonial quantity, not quality. ProPublica quotes a 2013 law review article that refers to him as the "most ubiquitous" expert witness. A quality job it isn't. But given enough opportunities, Vorder Bruegge has managed to turn unproven claims about the uniqueness of clothing into years in prison for people he's testified against. His track record shows he's willing to change his expert opinion if it better serves the prosecution. In his report, Vorder Bruegge wrote that John Henry Stroman and the robber had similar “overall shape of the face, nose, mouth, chin, and ears.” But Vorder Bruegge stopped short of declaring a match, saying the video and pictures were too low resolution for that. It wasn’t the first time, nor the last, Vorder Bruegge’s lab results said one thing and the courts were told something different. Court records and FBI Lab files show statements by prosecutors or Vorder Bruegge veered from his original conclusions in at least three cases. This is what happens when you care about convictions but not all that much about science. Vorder Bruegge's background as a geologist certainly didn't prepare him for a future of staring at grainy photos of shirts worn by suspects. But none of that mattered to the FBI which found him to be a useful champion of pseudoscience who could be used to lock people up. The entire report is a fascinating, if disheartening, read. Jurors and judges are easily swayed by FBI experts, even after cross examination exposes mathematically-impossible levels of certainty or, in at least one case, Vorder Brugge's admission he worked backward from the conclusion prosecutors wanted him to reach. Work like Vorder Bruegge's is exactly why a prominent federal judge resigned from a forensic committee in 2015. Judge Jed Rakoff recognized the DOJ did not want to fix its forensic problems. It only wanted to give the appearance it cared for as long as it took to sweep the embarrassment under the rug. The DOJ has too much invested in half-baked science and self-made experts to actually clean house and add more actual science to its forensic methods. Today's example of the government's ugliness comes to us courtesy of Customs and Border Protection. There's a crisis at the border if the latest national emergency is to be believed (it isn't), and the only way to stop it is to ramp up enforcement. If this means tossing a 9-year-old American citizen in the clink, so be it. A mother and her 9-year-old daughter were separated for 36 hours after the child fell into U.S. Customs and Border Protection custody because agents at the border didn't believe she was who she claimed to be, a mother says. This debacle started the way something like this usually does: with US citizens engaged in activity they engage in every day. In this case, mother Thelma Galaxia's children were being driven from Tijuana to the border crossing in order to attend school in San Ysidro, California. This was the normal state of affairs for her 9-year-old daughter and 14-year-old son. Traffic was heavy at the crossing so her friend told them to walk across the border to make sure they got to school on time. Both children were questioned by CBP officers. These officers decided 9-year-old Isabel Medina didn't resemble her passport photo. They accused her of actually being her cousin, Melanie. That wasn't enough for the CBP. It also decided to terrorize her 14-year-old brother, Oscar, by accusing him of being a criminal. The intimidated 14-year-old signed the document, thus making the CBP officers technically correct in their assumptions. They now had a paper signed by a human trafficker family member stating that Isabel Medina was actually someone other than the person she actually was. Galaxia's children might have been detained longer if she hadn't gone to the press. NBC7 reports the Mexican consulate contacted the station while Galaxia was being interviewed by journalists, saying the children were being released to her. Presumably, the station's requests for comment from the involved government agencies got the wheels rolling on her daughter's case. The CBP, meanwhile, has refused to comment on this detention, claiming it's still in the middle of investigating this incident. It seems like one of the CBP officers might have tried to contact the children's parents to straighten this out. But I guess it's a lot easier to intimidate children into false confessions when there are no other adults around standing up for their rights or contradicting the CBP's assumptions. As you may recall, last month, the EU Commission published -- and then unpublished -- a bit of horrifically misleading propaganda, in favor of Article 13, mocking those who criticized it as a "mob" whose strings were being pulled by an evil dragon (apparently Google) to "slay a knight" (apparently valiant copyright). The article can still be found via the Internet Archive. This wasn't from a politician or bureaucrat who had officially come out in support, but from the EU Commission's very own Medium account. It was certainly an insult to the European public. After some outcry, the article was removed, but the "apology" that was put up instead was similarly insulting, saying that it was removed because "it has been understood in a way that doesn't reflect the Commission's position." Riiiiiiiiiiiiiiiiight. It was just that crazy mob who "misunderstood" you calling them a "mob" for pointing out that the poorly drafted law might create all sorts of problems. Who authorized the publication of this entry, in which the EU citizens, who exercise their democratic right to protest, have been labeled as a "mob" and the dissemination of the article through the EU’s official Twitter account? 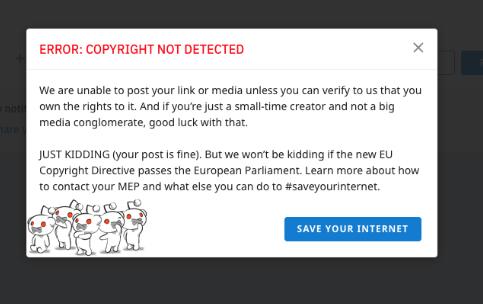 The Commission published a blog post on the proposed Copyright Directive on 14 February 2019 on the "Medium" platform. Hmm. Um. Look, I may not be the sharpest knife in the drawer, but even I recognize that when you are asked "who authorized" this article, you're supposed to actually say who authorized it. Responding by just restating the fact that everybody already knows that the article was published... is not answering the question. At all. How will the Commission ensure that such a disrespectful tone regarding the EU citizenry is never used again in publications? Right, so... again. This is not answering the question. The question is how will the Commission make sure it doesn't publish such an insulting and disrespectful article, such as calling its own citizens a "mob". And rather than answer that Juncker just responds that it "was not intended to attack people who disagree." Right, but it did. And the question is how do you prevent it from happening again. Given that the EU Commission and Juncker can't even bring themselves to admit error and apologize, apparently the answer is that it has no plans to prevent such insulting articles from being published again, because it can't even recognize when it's disrespecting the public. Incredible. How will the Commission ensure that its official publications are not biased, but that they provide European political information in a neutral and non-judgmental manner? The Commission has acknowledged that language and title are not appropriate, apologized and deleted the blog post. It attaches the utmost importance to a respectful public debate and also applies this standard to its own communications. I realize that baseball is a mostly American pastime, but hopefully those in the EU understand what I mean when I say "strike three." This comes nowhere near actually answering the question, and is a bit of historical revisionism. The EU Commission did not acknowledge that the language was inappropriate and apologize -- rather it complained that the mob mistook the EU Commission calling the public a mob as meaning the EU Commission thought they were a mob, and passive aggressively blamed the public for forcing it to remove the article over the mob's misinterpretation. But, more importantly, nothing here answers the actual question of how will the EU Commission make sure that the EU Commission's own publications are neutral, rather than political, in nature. Indeed, this kind of response is nearly as insulting as the original article -- completely disrespecting the public and their concerns about why the EU Commission decided to lobby for one version of a proposed Directive. It’s easy to forget that the broadcasting airwaves are—and once were treated as—a commons, owned by citizens, not powerful media companies. Admittedly, as that article notes, this created some amount of chaos, mainly because the spectrum got too crowded, and there was widespread interference between different signals that made the whole space a mess. Over time, laws were put in place to "regulate" the wild west, but what happened was we turned what had been an open commons into a locked up space where only giant media companies could prevail. The US, at the very least, decided that the way to deal with this wild west was to treat spectrum as a property right that could be "licensed." And in doing so it set things up such that large broadcasters could collect many licenses and dominate markets. What had been the open spaces of the public to use for a variety of creative endeavors turned into a locked down space for giant corporations. 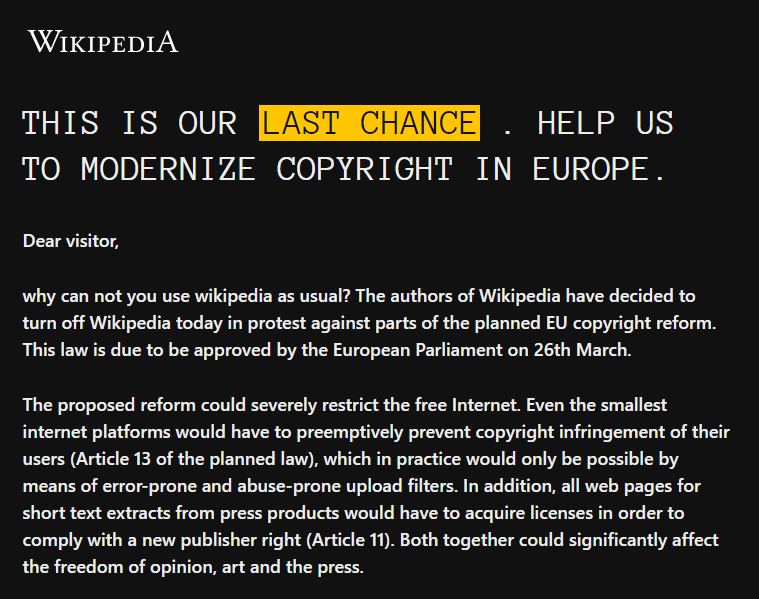 While there are some notable differences, the attempt by the EU to pass Article 13 is truly an attempt to replay this unfortunate scenario nearly a century later. There was a good rationale for radio regulations in the past -- dealing with all of the interference that made using radio difficult -- and as one 1927 academic so succinctly put it: "highly annoying and almost destructive." But, of course, we lost something when we went from an open radio system for the public to use to one that was locked up among just a few corporations. And the wonderful thing about the internet was that we didn't have the same limitations. There is no "interference" like there is with more limited radio spectrum. And while there are reasonable questions about companies dominating parts of the internet, others are not completely locked out as they were in radio. 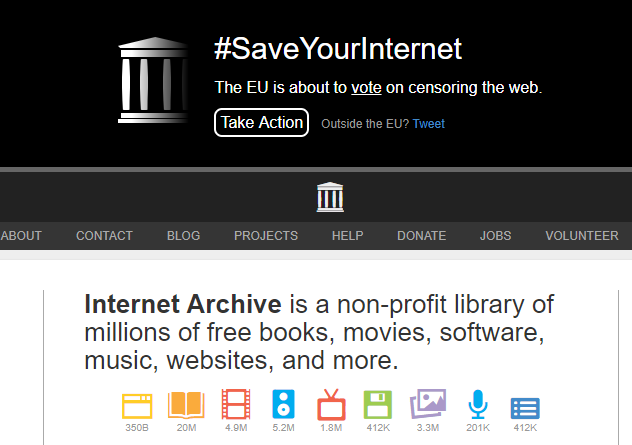 Unfortunately, the entire design of the EU Copyright Directive is an attempt to do the same sort of thing to the internet: to lock it down. The EU Copyright Directive -- in particular Articles 11 and 13 -- are designed to make the internet a bland corporate broadcast medium dominated by a few giant companies. This dismisses the roots of the internet as a commons-based communications medium that anyone can use. The very structure of Article 13 makes this clear. The demand that everything must be "licensed" on internet platforms makes no sense. Do you "license" content in order to communicate with your friends? Do you license a song to sing? Do you license it when you quote from a book? Licensing is not necessary for communication -- it is only necessary for "broadcast." This is the core problem that the legacy gatekeepers have with the internet. It's a communications medium, and they come from the broadcast era. Their entire structure is built off of licensing to broadcasters. And rather than recognize that everything has changed, their only play is to try to shove the internet into a similar broadcast structure. We killed off the open commons of radio nearly a hundred years ago. 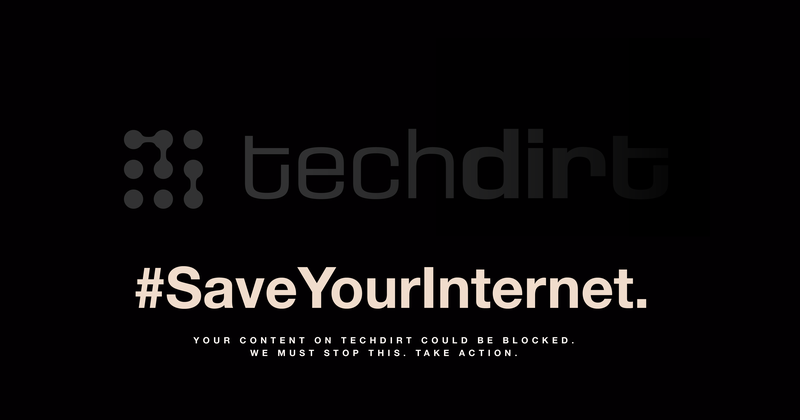 Hopefully the EU chooses not to do the same to the internet this year.